How can Louisville and the state help create a culture of architectural design? There are 724 registered architects practicing in Kentucky, according to a new survey of the profession. The National Council of Architectural Registration Boards (NCARB) has released its latest data, showing 109,748 architects practicing nationwide. How does Kentucky compare to other states around the region and country? Let’s dig into the data. NCARB broke its data down into two categories: resident architects who live and work in the state and reciprocal architects who maintain a license to practice in Kentucky but live elsewhere. The survey counted a total of 2,630 architects who can legally build in the state. That’s 2.6 times the number of outside architects as local architects. Crunching a few numbers, it becomes clear that Kentucky and its surrounding region are being designed by fewer architects than the rest of the nation. Part of that stems from architecture as a trade attracted to larger cities. 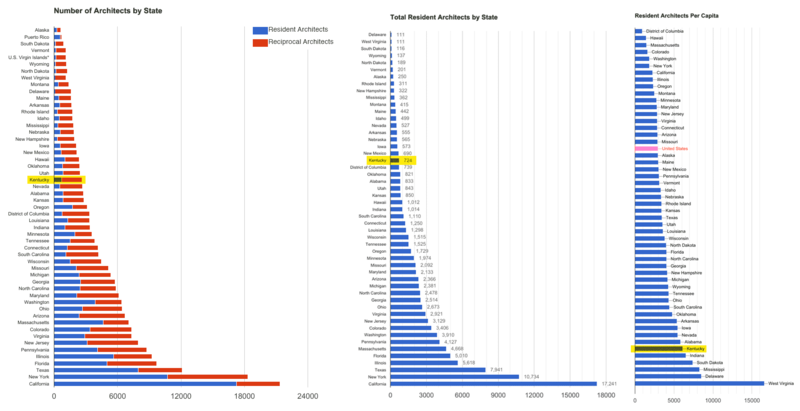 It’s no surprise that California, New York, and Texas are the states with the most resident architects. There, the locals vastly outnumber the out-of-towners. Looking at local architects per state capita*, Kentucky also ranks low on the list. The Commonwealth has the sixth fewest architects per capita with one architect per 6,111 residents. Only Indiana (1:6,521), South Dakota (1:7,396), Mississippi (1:8,258), Delaware (1:8,505), and West Virginia (1:16,586) have fewer. Stack a few of those states together and you quickly see a regional picture. * The NCARB survey used 2015 data, so we compared it with Census estimates from the same year to calculate our figures. Washington, D.C. ranks at the top of the per capita list with one architect per 907 residents, but it’s a dense, urbanized area and therefore an outlier. Surprisingly, Hawaii (1:1,408) is the top state. Design powerhouses in New York, California, and Illinois rank lower at 6, 7, 8 respectively. The national average is one architect per 2,924 residents. For another possible cause of Kentucky’s lower ranking of architects per capita, we have to go back to school. The only architecture school in the state is at the University of Kentucky (UK) in Lexington. The state’s largest city, Louisville, has no such program and thus no annual influx of new students who might opt to stick around after they earn a degree. And getting young talent to stick around is much sought after in top cities today. Young architects are likely to be experimental in their approach to urban living. They might look at cities and urban problems from new angles. They also help established firms grow and bring in the latest skills. Architectural education in a city serves as a sort of spring of new ideas and talent. Architecture students are notorious for their workaholic natures, and studio projects most often focus on local sites. When you’ve got so many fresh eyes looking at a city where they’re learning to design, you can get some pretty amazing ideas. They invite the entire community to look at their built environment in new ways. In the past, UK has offered Louisville studios (like this great one studying Portland), but there’s nothing like a local program. This is not to say that because Kentucky has fewer architects than other states that we necessarily have inferior architecture and design quality. There are immensely talented architects practicing in the Commonwealth alongside an array of other design professions. Many have achieved national praise for their work. Still, there are some major challenges presented by the numbers. I’m repeatedly told how the practice of architecture in Louisville can feel stifled or too much like a business. The state is small enough where many architects do not want to speak up or take risks for fear of losing a client. And there’s the perpetual issue of whether a project should go to a local firm or be handed to a top-name out-of-towner. We see it as about creating a culture of design—across all design professions, but especially architecture. Architects are trained and work differently than artists. It’s part of what makes an architectural education so special. The more people, the more eyes you have looking critically at important issues of design in the state, the better off we all are. What are your thoughts on architecture in Kentucky and the region? Does Louisville need an architecture school? Are you an architect with another point of view? Share your thoughts in the comments below. Lexington, being both away from the edges and having our architecture school, seems to have a better chance to nurture architects/architecture. I disagree on the edge vs. center geography angle as that still simply pits locals vs out-of-towners. If it’s not local it may as well be from anywhere. Why would an Indiana architect be more likely to build here than a Chicago, New York, or St. Louis architect? Many of Louisville’s recent apartment complexes have been designed by firms from Nashville and many hotels by Texas companies. I see it more as cities with architecture schools act as architectural magnets. Cincinnati has more architects because of UC. Lexington fosters its architects with constant influxes of new talent and thought from UK. St. Louis and Kansas City both have robust architectural communities. One point I left out of the article above is the economic power of larger cities to draw architects and higher-profile projects. Architects don’t just go to big cities because they like it there, although some of them do. They go because there’s plentiful work and a strong community of design. The higher cost of big cities supports bigger budgets and offers more freedom to design in new ways. In affordable Louisville, costs often keep budgets too low to compete. I wish NCARB would have broken down the counts into the top 50 MSA’s as that would have allowed a more nuanced look at where people are actually practicing. In a rural state like Kentucky, it’s easy to see how the per capita number can be diluted by population density. Is there interest in a school of architecture here? The state probably would not locate one at U of L, but could Bellarmine or Sullivan be a viable option? Sadly, we have not been a magnate for great local architects. It seems like we could do better than a suburban public school architect like Norman Berry, for instance, who gave us the “imaginative” addition to the Kindred headquarters. Its the same problem we have with any profession dependent on development including landscape architects, ecological engineers, urban planners, etc. All the innovation happens on the coasts, if you want to be involved you move there.